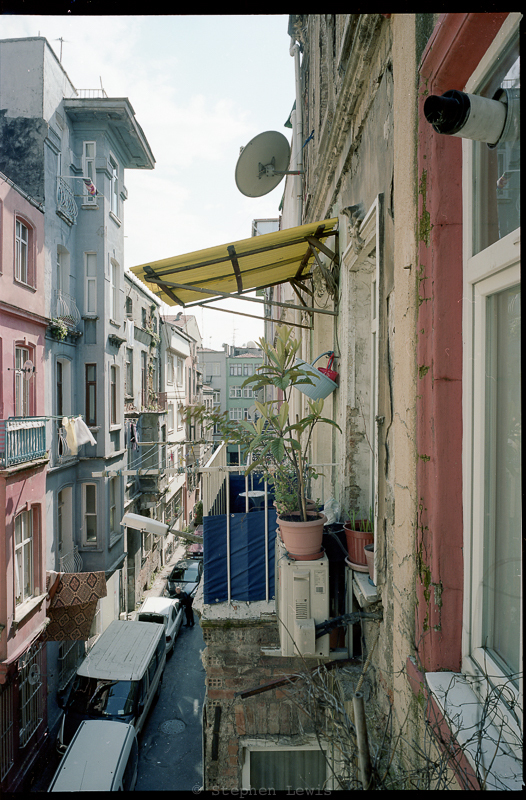 Two views from a balcony on a cul-de-sac street in the Tepebaşı quarter of Istanbul, anno 2013. 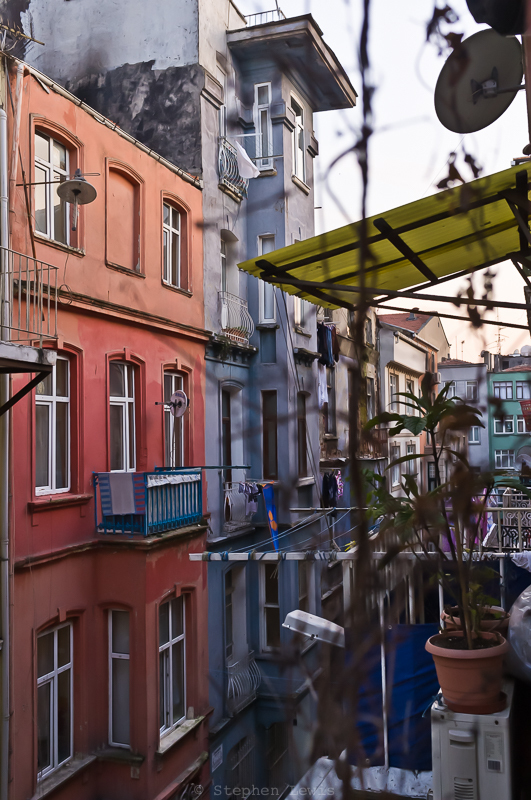 The buildings: Row houses built a century-and-a-quarter ago when the neighborhood was populated by Istanbul Greeks; the narrow frontages of the buildings dictated by late-19th-century regulations issued in the aftermath of fires that had swept gutted swaths of the city. Even day, these balconies continue to form an interstice between private and public space, serving as mini-terraces, extensions of domestic space, and perches for observing street life, chatting with neighbors, or just enjoying late day breezes. The photo above was taken in 6X9 cm format on 120 color negative roll film through a 55mm Rodenstock lens (viewpoint equal to 24mm on 35mm film or “full-frame sensor” digital formats) mounted on a Toyo folding field camera. The photo below was taken with my customary APS-C format Fuji X100 digital camera (a “full-frame” equivalent of 35mm). The negative of the image at the top was scanned but, otherwise, not processed further. The sharpness and optical accuracy of the Rodenstock lens and the delicate colors of negative film stock are inimitable.